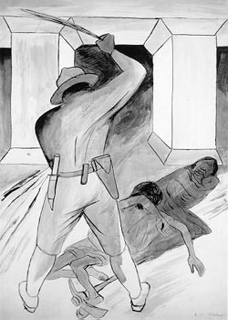 A symbolic depiction by Mexican muralist José Clemente Orozco (1883-1949) of official ‘Cruelty‘ toward common people. • The Inspector General’s report is far more critical of Neubacher and Allen than one might think from the spin park officials and their friends have put on it. • All the press reported Lunny had been initially unwilling to sign a use permit with the park for his oyster company, but only The San Francisco Chronicle even hinted at why: initial drafts of the permit agreement would have ultimately put him out of business. • None of the press took time to look into Neubacher’s trying to harm the Lunny family’s beef operation (on historic G Ranch) in retaliation for Lunny’s lining up widespread support for his oyster company. Not only did the park superintendent try to sabotage the acclaim their beef ranch was receiving, the Lunny family found themselves in protracted negotiations with his administration over renewal of the ranch’s lease. The Inspector General said it hadn’t found evidence of retaliation but failed to investigate some of Lunny’s key complaints. Future postings will provide a closer look at what the Inspector General actually revealed about the park’s war against Drakes Bay Oyster Company. This week’s posting looks at merely one of the many ways Supt. Neubacher has harassed the Lunny family. The story begins in 2006. Lunny (left), who is active in Marin Organic, wanted to be able to promote the fact that as a rancher he is a good “steward of the land,” so he applied for certification from an organization called Salmon Safe. The Oregon-based nonprofit issues certificates to agricultural operations that use their land in a sustainable fashion, preventing erosion and avoiding pollution of waterways. 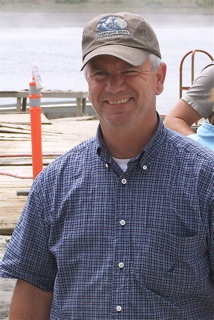 Salmon Safe executive director Dan Kent declined to relate Neubacher’s comments but noted that after the park superintendent’s call, the organization put Lunny’s certification on hold until his ranch could be inspected again. • The park had complained that the Lunnys mowed their silage too low, but investigators found the grass was two feet high. In addition, Lunny uses a “no-till drill” to plant grass seed, so the humus mat of his pasture does not erode. • The park accused Lunny of not having a fence between his pasture and Drakes Estero, where he grows his oysters. In fact, none of the ranches along the estero have such a fence yet cattle seldom go near the water, he said. The Lunny family had complained in writing to the Interior Department that Neubacher was “undermining” their “certifications,” but the Investigator General investigators’ report never addresses this example of harassment. 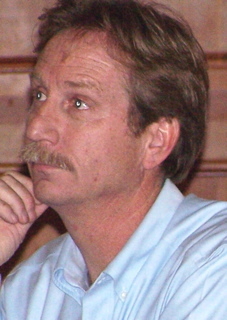 Feb. 5, 2010 — This man has been appointed to run Yosemite!! It is beyond belief, but so typical of Park Service. They listen to no one. I live just outside of Yosemite where they had their out of control, “control” burn last August that cost us $15 million, not to mention the air quality and environmental impact of this burn at the height of the fire season. Makes a great deal of sense, doesn’t it? The ranchers within the seashore were allowed to remain under leases signed in the 1970’s. The ranchers received money up front for their lands under an agreement that most would be off the National Park Service lands after 20 years of the signings. In violation of the signed agreements, these ranchers remain way over 20 years after their leases expired under annual reservation agreements brought about by lies like this article is promulgating. We should be supportive of our National Park officers who are serving the people rather than a small group of squatters. The ranchers at Pt. Reyes claim that they know how to beat the system and this is one way that they do it. I find it odd that you call a rancher a “squatter” when he is paying his rent in accordance with a lease. The ranchers who had to move out of the park — after a designated period of time following the Park Service’s purchase of Point Reyes — were those who had not owned the land they were on. All of them left, and the park took possession of the property. If a rancher owned his land when it was sold to the park and if he or his descendants continue ranching it, the family is entitled to stay there in perpetuity. Moreover, the ranches have clearly benefited the environment. Cows have kept Point Reyes in grassland for more than a century. And before the cows arrived with the Spanish, one of the largest elk herds in the world ate back the brush. Various species of wildflowers that are found only on Point Reyes evolved in the peninsula’s grasslands. Unfortunately, when the Park Service has taken over ranches, it has typically allowed former grasslands to brush over, creating conditions Point Reyes hasn’t seen since the Pleistocene era. The Park Service’s land-management policies are drastically changing historic ecosystems on the point. Ultimately they may well kill off several native species of plants. This is not supposed to happen. Finally, what the ranchers got “money up front” for were many of their rights, including the right to manage their operations without needing federal permission to merely alter buildings, for example. ‘Nuff said. Sparsely Sage and Timely is powered by	WordPress 4.9.10 and delivered to you in 0.436 seconds using 52 queries.